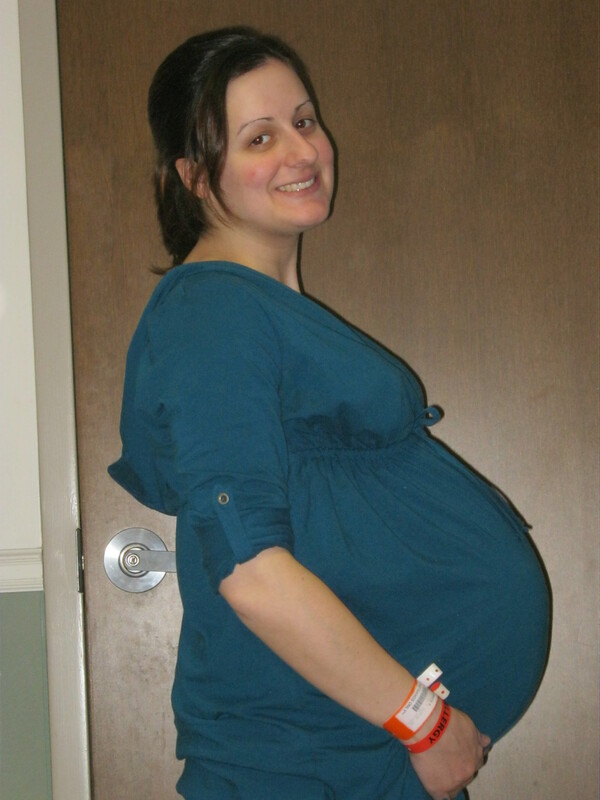 A Beautiful Ruckus: 27 Weeks!! 27 weeks and still pregnant! Every week seems like such a huge accomplishment at this point. The babies’ sonogram yesterday showed that everybody’s heart rates are still awesome and their fluid is all holding steady. Ellie’s fluid actually measured a little bit more than last week. The ultrasonographer did say that the way the baby is positioned in the sac will influence how much fluid they are able to measure-but the point is, she still has fluid and it hasn’t decreased anymore! The daily strip tests that they do also show that their nervous systems are developing really well. The steroid shots that they gave me when I first came in at 24 weeks probably have something to do with that. Next week, they will give me another round of those since they help develop the babies’ lungs. I don’t think I’ve ever been so excited about getting shots before! Tuesday, Sean and I went on a tour of the NICU. It’s taken me a couple of days to be able to sit down and actually blog about it. We watched a DVD that the March of Dimes gave us about the NICU last week, but it was still extremely emotional actually going in there and seeing the rooms that our kids will be in. The staff here have done a wonderful job of preparing for the babies’ arrival. Two rooms have already been closed off and sterilized specifically for Caleb, Abby, Elijah, and Ellie. There is even a sign on each door that says “These rooms are reserved for quads.” Literally all they need to do is slide the glass doors open and walk in there with our babies. I’ve been told that every morning at 5am, the NICU gets a report on how I’m doing so that they know if they should be expecting an onslaught of babies that day or not. It was very encouraging for us to see how ready they are for us. But at the same time, it was extremely hard to see the four incubators that our babies will be fighting for their lives in and all of the machines that surround them. I actually cried my way through the NICU because it seems so real now. Up until Tuesday, I knew they would be headed there, but I had chosen not to concentrate too much on it. Sean kept himself together, but I know it was hard on him as well. When we got back to my room, I broke down and cried for a good long time while Sean just wrapped his arms around me. The closest I can get to describing the emotions is to compare it to how I felt when we originally found out that we are having quads. Neither of us want our kids to have to go through what they are going to go through in order to come home. I wish I could do something so that they could skip the NICU altogether. I don’t want to see my babies hurting. So even though I’ve been saying that I want to stay pregnant longer, I REALLY want to carry these babies as long as possible now. Every extra day that they are inside me equals 3-4 days less that they will have to spend in the NICU. I want them as big and as developed as possible before they show up. And when the time comes to deliver, I really am glad that we are at Saint Luke’s. The nurses in the NICU seem to know exactly what they are doing, and they are ready for them. I’m so grateful that our babies have the care that they do inside the womb and will have an amazing level of care outside the womb that will give them the best medical chance they have of surviving and thriving! And I’m grateful for a God who already knows what is in front of our family before we even get there. That knowledge comes with a certain sense of peace that it’s not going to be a surprise to Him. Thank you again, from the bottom of our hearts, for your prayers for us and our babies. You are right, they are wonderfully set up there. I personally know 4 preemies that were born there, and by the time they were 2, you'd never know that they ever had to spend any time in a hospital at all! Keep up the good work Mommy! :-) We love you all! Hi again! Sounds like you are doing great...relax, and sleep. The babies are cookin' and hopefully will stay in there as long as possible. 27 weeks, woohooo! That is awesome and you are doing great! I had my preemie at St. Luke's on the Plaza and the nurses were phenomenal. I know what you mean about being emotional touring the NICU; I was too. One thing that's kind of cool is that you'll get to see firsthand the miracle of your babies' growth. It seemed like we would be there forever but, like everyone said, the time flew by and we were bringing our little guy home before we knew it. Blessings to you and your growing family; you're in my prayers! yay for those babies getting bigger even though its harder on you... what a sacrificial thought to keep them in you as long as possible... you seem like a woman who will be an excellent mom! yay for every extra day! Congratulations on making it to 27 weeks. Thats good you finally got to go tour the NICU and see where you babies will be staying and meeting the staff that will be taking very good care of when they come. Hopefully they'll in and continue growing and developing and getting stronger. They hardest part about the NICU when the babies are in there, is when you have to leave. Matthew got to the point he knew we were leaving and would though a fit so loud it would activate the sound alarm in the NICU. Thats great they'll be getting the second steroid shot next week, this time you'll get to see how long that needle is... thats if you really want to know. What a trooper you are!! I sure love you! When you cry, I cry. When I see your picture, I smile. When I think about the amazing truth of God knowing those four souls- before He even chose the perfect time -to chose Rebecca and Sean to parent them, I sigh and feel His presence around you all. I am filled with love and care for you all. I am praying your babies stay in their womb so long that everyone is in awe, and know God is in charge. I am praying your babies are in NICU so briefly that everyone is in awe, and know that God is in charge. Well, even more so than we all know that already. Not only are you wonderful parents, your faith is making many other people's faith stronger too. Thank You! Wow, Becca - so much going on with you and Sean and the babies! We continue to pray for all of you and that they stay safe and snug in their momma for as long as possible. It's so great to know you have confidence not only in God's good hand, but in the staff at St. Luke's. I almost jumped for joy this morning watching Fox News. 17-year old quads from Texas were featured who have all been accepted into Mensa. I looked at their beautiful faces (two girls and two boys) and imagined Caleb, Abby, Elijah, and Ellie. Love all of you dearly! You're doing great and looking great! Keep up the good work! You, Sean and the babies are in our prayers all the time! Can't wait to meet your little ones! This post brought tears to my eyes... We are praying for you guys. I am so glad too you are at St. Lukes, these babies are not just in a great hospital but in a great God's hands too. I am specifically praying that you stay healthy and well and safely in a hospital bed through the weekend of March 12th! Well and anything after that would be great too! Thank you so much for your honest writings about the things that you are thinking and feeling. A major congradulations on 27 weeks. I am still praying for a minimum of 30 weeks. We know the God of the Universe has you all in His hand. I enjoy the picture you post each week. It is neat to watch your tummy grow as each day brings those precious ones a healthier start to post-womb life. Rebecca, you look beautiful. YAY 27 weeks! Almost there! Hopefully, you can be well past 30 weeks when the littles arrive! Mindy...what a cool link... thanks for sharing....!! Yay for 27 weeks! Keep those babies cookin'. Great job mama!! SOOOO glad to hear everything is going well. The NICU is a sad place, but awesome at same time. Still looking super cute!! Congrats on making it to 27 weeks! I am praying that you keep those babies in there as long as you can so they will spend a limited amount of time in the NICU! Like some one else said, the best part about the NICU is getting to see the miracle of your kids growth. Mine were born at 23w 5d, so we got to see alot of miracles! I always liked to think that God decided we needed some extra time with our kiddos, so instead of them continuing to grow in my tummy, we got to watch them grow in their isolettes. You are doing awesome, relax, get some rest, and concentrate on growing those babies as long as you can!